Note: McFatty Monday's is no longer! Instead I will post Momma's Monday Check-in. Join me as I eat and exercise my way through the next 13 weeks. Sleep: Co-sleeping with Roscoe is proving not to be the saving grace we first imagined. He's such an active sleeper, and prefers to be in contact with my body at all times. The belly makes it difficult to find comfortable positions to sleep as it is, and Roscoe's constant tossing and turning is making our bed even more uncomfortable. I can't live without: Tums....the heartburn is BACK. I miss: Still waiting to get well, and going on five weeks of sickness. Make the coughing stop! I am looking forward to: A prenatal appointment at the end of the week, and hopefully passing my glucose tolerance test. Best moment this week: Andy came home! Aha Moment: Parenting as a couple is so much more fun than doing it alone. Milestones: I experienced my first middle-of-the-night leg cramp. Yay? Movement: Like Roscoe, Little Sears seems to prefer the right side of my uterus. Exercise: I made lots of prep progress this week! I finally purchased a weight bench, which will be delivered tomorrow. After being honest with myself that my typical "all or nothing" approach just isn't working at this stage in my life, I decided that scaling back my expectations would help me to follow through with a workout plan. So I identified a workout routine that is only three days a week, includes a weight component and a cardio component and can be completed in a little over an hour. The important thing right now is to do SOMETHING. Diet: After several weeks of wild weight gain, I decided to write down every morsel of food that went into my mouth. I didn't intend to cut calories but of course I was on better behavior since I was holding myself accountable. I averaged about 2000 calories every day. Hopefully I'll hold steady for the next couple of weeks...or maybe I'm just on the path to gaining 46 pounds like last time!! I also planned out my meals this week to help me to stay satisfied and on track while Andy is away (again. boo.). Goals for the upcoming week: To have a successful first week on my new fitness plan and find time to blog more! I don't know how you are managing to cosleep right now- I have been sleeping alone and I love it! Ugh, sorry to hear that co-sleeping isn't working out like you hoped it would. You need your sleep! And I've just been re-introduced to the wonderful world of heartburn/reflux. I was lying in bed the other night and was thinking "Hm...my throat and chest feel all weird...how random" and then I remembered the last time I felt like this and my slow-moving brain connected the dots. Ha! Laura: I really loathe heartburn. I thought of you and Bella when we were at Roscoe's pedi appointment last week--the doctor insisted I put a number to the quantity of words that Roscoe says on a regular basis... I had no idea so I guessed (and on second thought, I totally underestimated) but I was surprised when he said that 20 words is average for kids their age...TWENTY!? I almost told him about your daughter, who was in the several hundreds months ago. Isn't that crazy? 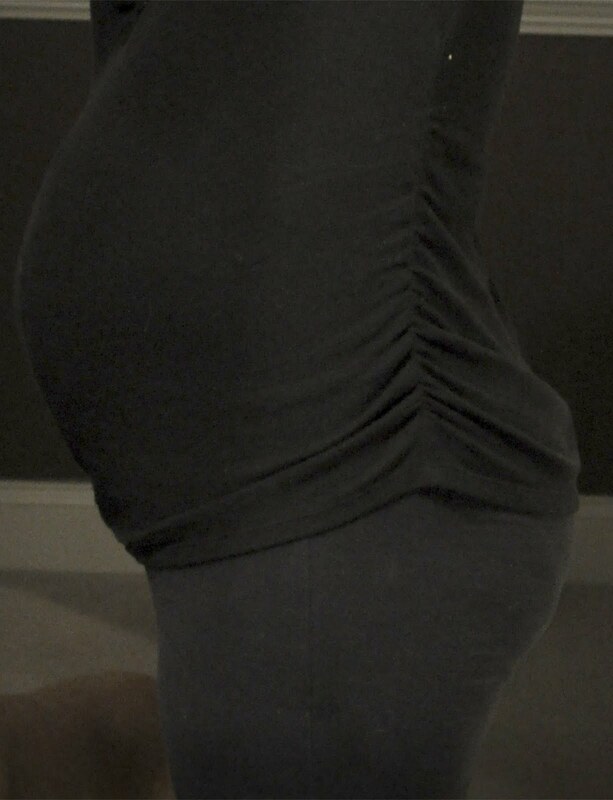 Oh my gosh, just 13 weeks!! You look great! I think your belly is smaller this time. I have found that my weight gain has slowed down a lot over the past month or so (but I could have the flu to thank for that). I wish I had kept a better record along the way when I was pregnant with Lilah for comparisons sake. I feel you on the heartburn...it's brutal! Did Roscoe have a lot of hair when he was born? Everyone likes to tell me that it's because this baby has hair. Although, Lilah had a full head of hair and I never had a day of heartburn or indigestion with her. I hope you feel better soon and kick the cough. I guess pregnancy can really effect your immune system. I feel like I have been sick since September basically. .
Good luck with the glucose test! This baby looks smaller than roscoe at this point! Maybe those itty bitty newborn clothes WILL fit him!